When you activate your bonus categories, you’ll earn 5% on bonus category purchases up to $1,500 from October 1 through November 22, 2015 and 10% on bonus category purchases on bonus category purchases up to $1,500 from November 23, 2015 through December 31, 2015. In other words, your quarterly bonus maximum dollar amount will be reset on November 23, so you can potentially earn cash back on up to $3,000 in bonus category spending this quarter. To activate your bonus categories, see this link. 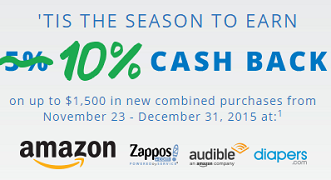 To learn more about the 10% cash back promotion, see this FAQ. 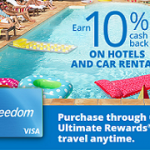 Interested in the Chase Freedom card? If you don’t already have a Chase Freedom card, it is currently offering a $150 bonus after you spend $500 in purchases in your first 3 months from account opening. That’s up from the $100 that is typically offered. For more information on that offer, see this link.